The World Health Organisation says it is too early to say whether a mixture of known diseases or something new is responsible for the deaths of more than 60 children. A mysterious disease has killed 61 of the 62 children admitted to hospital since April, although there is no indication it is spreading from person to person. Patients suffer a high fever, followed by severe respiratory problems that progress quickly. 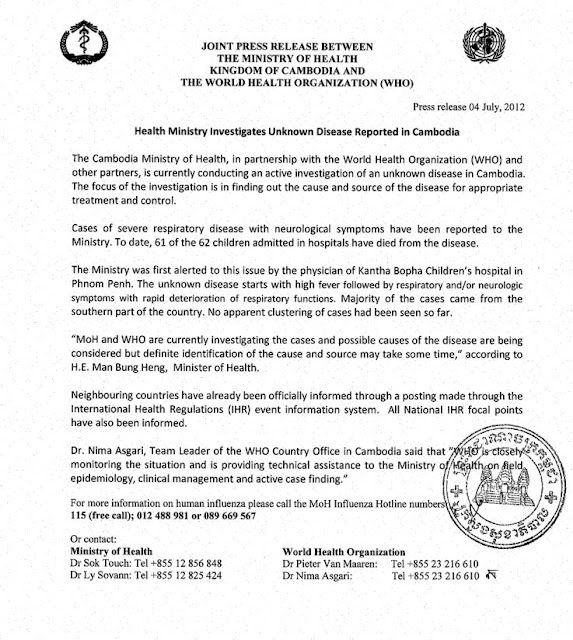 Dr Nima Asgari of the WHO in Phnom Penh said health workers were combing through the records of the victims, most of whom were under seven.